The San Diego Unified School District was one of 60 big-city public school organizations around the U.S. that pledged Monday in Washington, D.C., to improve the academic and social outcomes of boys and young men of color. The pledge is part of President Barack Obama’s five-year, $200 million “My Brother’s Keeper” program to assist African-American and Latino youth. The districts making the pledge are responsible for educating 40 percent of African-American and Latino children in the U.S. who are living under the poverty line. “The pledge we are making with President Obama is a promise to our boys and young men of color that we firmly support equity and the opportunity for our students to fully realize their potential,” said SDUSD Superintendent Cindy Marten. 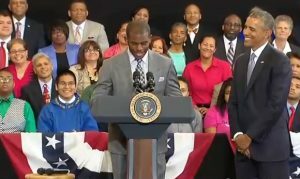 President Obama being introduced by NBA player Chris Paul July 21, 2014. Photo credit: NBA via YouTube. San Diego schools enrollment is 46.5 percent Hispanic and 10.5 percent African-American, according to Marten. The graduation rate for white students in the SDUSD last year was 94.1 percent, and 92.9 percent for Asians. The rate was 82.8 percent for African American students and 81.6 percent for Hispanics. The district’s Board of Education adopted a resolution on June 10 to support the pledge. implementing a uniform policy with direction to principals to reduce the disproportionate number of suspensions of young men of color.